Mother’s Day is just around the corner! To celebrate mothers everywhere, we’re doing a special giveaway. If you buy one pickleball bag, we’ll give you 15% off our cute “Dink Darling” pickleball visor. Pickleball is one of the fastest growing sports in the U.S. right now. With over 2 million players and that number growing by over 10% each year, Pickleball is a fast-paced activity. Playable on both indoor and outdoor courts, it’s a great hobby for any season. Maybe your mom, aunt, or grandmother is already a fan of the sport, or maybe they’re looking for a new hobby. It makes for a great physical activity, that’s not only fun, but a great way to meet others. Pickleball is especially popular in retirement communities and you can find information about leagues, tournaments, and rules and regulations from the USAPA, the USA Pickleball Association. 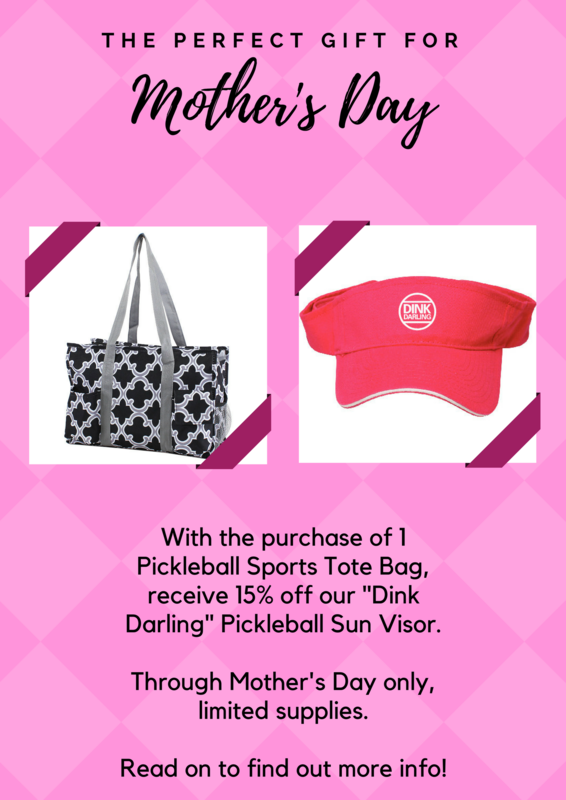 Whether the person you know already loves pickleball or they’re just starting off in the sport why not help them get into the swing of things with a beautiful tote bag perfect for carrying pickleball gear, and a cute, bright “Dink Darling” visor. They’ll be the envy of everyone else on the court with their stylish accessories. Getting this deal is easy! 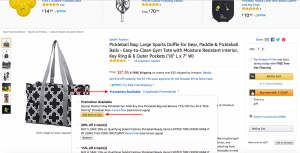 Just go to our pickleball sports duffle listing on Amazon and check out the promotions available. Click the Promotion Available link at the top of the listing and choose the “Add Both To Cart” option. The promotion will automatically be taken off at checkout. This sale is only until Mother’s Day, so act quickly, there are limited supplies!